Maj. Gen. Charles F. Bolden at the University of South Carolina's Thomas Cooper Library. Gen. Bolden has donated his personal archives of papers, personal items and professional artifacts for curation by the University's South Caroliniana Library. The Charles F. Bolden Jr. Collection includes personal items such as letters and photographs, as well as items from Bolden's time serving both NASA and the U.S. military. Bolden doesn’t resent this confusion, but rather seems to welcome the opportunity to discuss his father’s legacy. He said that his father was an incredible motivator both on and off the field. “He had a saying—it’s not the size of the dog in the fight; it’s the size of the fight in the dog,” Gen. Bolden shared. That saying became a touchstone throughout the younger Bolden’s life. Back when Gen. Bolden was a student in the early 1960s (and a second-string quarterback on his father’s football team), C.A. Johnson was one of just two all-black schools in a segregated Columbia. Gen. Bolden discusses what it means to share his story with kids from his hometown. One of the dreams Bolden said his parents inspired him to shoot for was to attend U.S. Naval Academy. However, no one in South Carolina’s Congressional Delegation at the time would give him an appointment, so Bolden wrote to then-President Lyndon Johnson, who helped him to get an appointment from Chicago Congressman William Dawson—the third African-American congressman of the 20th century. 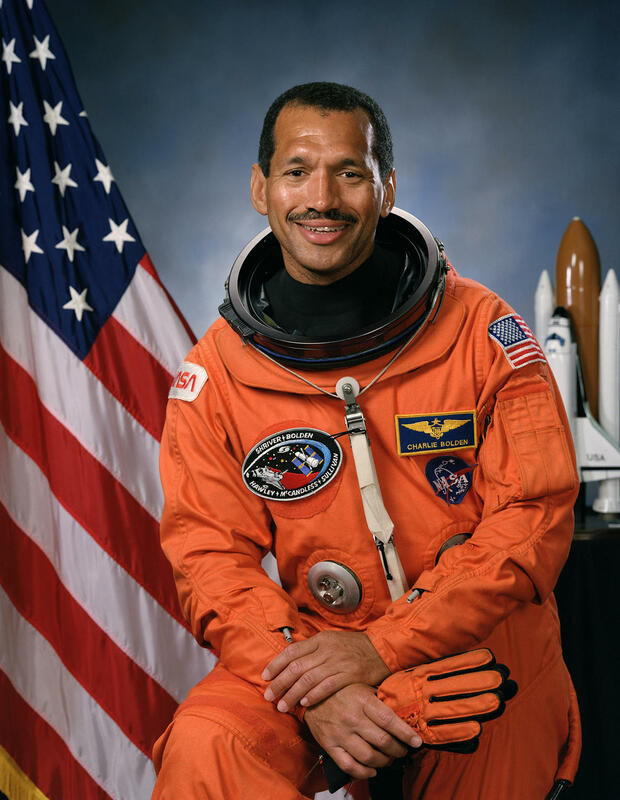 Maj. Gen. Charles F. Bolden Jr. during his time at NASA. That’s not the only obstacle Bolden faced on the road to higher education. Bolden said that when he took his Advanced Placement exams at USC, he wasn’t allowed to take the test with the other students. He was asked to take his exams, instead, in a janitorial closet. “Yeah, I think it was a broom closet, because you know [I was] taking it here as opposed to taking it at C. A. Johnson or a black facility where I would have been able to take it with the rest of the class,” he said. But, as Bolden wryly observed, the location “didn’t seem to make a difference” with his scores. Despite Bolden’s complicated history with the university, he wasn’t deterred from donating his personal archive to USC’s South Caroliniana Library. He said he was impressed by the library’s handling of his mother’s personal archives. Bolden’s mother, the educator and librarian Ethel Martin Bolden was a leader in the local African-American community, and her work as an educator was posthumously contributed to Caroliniana Library in 2002, in the same year that Bolden and long-time friend Ron McNair spoke at the university’s commencement and received honorary degrees. “I’d like to think that my collection adds to her story and continues her work,” Bolden said in the university’s press release for his new collection. Furthermore, Bolden said that he still considers Columbia his home, though the 71-year-old now resides with his family in Mt. Vernon, VA, and he wants his past to be remembered in his hometown.